An outside group that&apos;s aired two statewide TV ads that promote Utah Sen. Orrin Hatch&apos;s conservative credentials has now taken a more aggressive approach in assisting the six-term Republican&apos;s re-election. Freedom Path, a 501(c)(4) issue advocacy organization, is out with a direct mail piece that informs voters about legislation it says former state Sen. Dan Liljenquist and state Rep. Chris Herrod supported last year that blocks access to public records. The ad makes no mention of Hatch or the Senate race, but they happen to be challenging Hatch. 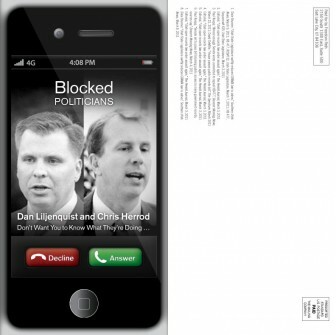 "Politicians Dan Liljenquist and Chris Herrod," the mailer reads. "Special Interests&apos; Dream. Utah Taxpayers&apos; Nightmare." Several Republicans, including Liljenquist and Herrod, are challenging Hatch from the right, hoping to take him out at the April 21 state party convention. Conservative outside groups including FreedomWorks and Club for Growth are also working to end his Senate tenure. Previous Freedom Path TV ads tied Hatch to conservative Utah Sen. Mike Lee and promoted his opposition to "Obamacare." Scott Bensing, a former National Republican Senatorial Committee executive director, is a board member of Freedom Path, which is not required to reveal its donors. Its sister organization, Freedom Path Action Network, an independent expenditure-only committee, does have to reveal its donors, but it has yet to spend any money on IEs.